On the territory of the Museum of Personalities, created under the open sky in the city of Khachmaz, busts monuments of three more prominent Azerbaijanis have been installed. Thus, the number of busts of famous intellectuals, poets, writers, cultural workers and artists established here has reached 59. New busts were erected in honor of famous composer Ramiz Mirishli, Omar Eldarov and Azerbaijani Lieutenant General Huseyn Rasulbekov, Azertag reported. Azerbaijani composer, teacher, people's artist of the Azerbaijan SSR Ramiz Mirishli wrote the operetta "The Kidnapped Girl" (1982) and "Let's Be Relatives" (1983), two symphonies (1972, 1980), "Symphony" for chamber orchestra (1974), a concert work and symphony orchestra. He also was a composer of such films as “Apple like apple” and “Gazalkhan”. His awards list includes Shohrat and Sharaf Orders. Sculptor Omar Eldarov is an Azerbaijani muralist sculptor, Honoured Art Worker of Azerbaijan (1961), People's Painter of Azerbaijan (1982), full member of the National Academy of Sciences of Azerbaijan (2001), full member of the Russian Academy of Arts (1988), president of Azerbaijan State Academy of Fine Arts (2001), and academician. He is the author of Sattar Bahlulzade's portrait, Muslim Magomayev's bust, monument to Huseyn Javid (1993), monument to Mammed Amin Rasulzade (1995), Azim Azimzade (2002), Rashid Behbudov's bas-relief (2002), Nizami Ganjavi's bust in Cheboksary (2004), gravestones of Zarifa Aliyeva, Haydar Aliyev, Sikh-Ali Gurbanov, Tofig Guliyev in the Alley of Honorable Burial in Baku, gravestone and bas-relief of Uzeyir Hajibeyov in Vienna (2005), Niyazi's bas-relief (2006), monument to Haydar Aliyev in Nakhchivan (2006), monument to İhsan Doğramacı in Ankara (2003), memorial plaque of Tofig Guliyev (2006), memorial plaques of Haydar Aliyev and academician Zarifa Aliyeva (2008). Omar Eldarov was awarded "Gold medal" for the contribution and development of Azerbaijani visual arts during solemn ceremonies dedicated to 65th anniversary of the Azerbaijan Artists Union. He was awarded commemorative medal "For merits for Academy in honor of 250th anniversary" in 2007. Azerbaijani Lieutenant General Huseyn Rasulbekov served as commander of the anti-aircraft missile forces of the Baku Air Defense District in the Soviet years. General Rasulbekov was awarded the Order of Lenin, World War II degree, Red Star, Red Banner of Labor and 14 medals, including "For Military Merit", "For the Defense of Odessa", "For the Defense of the Caucasus", "For Impeccable Service" I degree and others. By the Decree of the Presidium of the Supreme Soviet of the Azerbaijan SSR of July 28, 1966, he was awarded the honorary title "Honored Engineer of the Azerbaijan SSR. The Museum of personalities, which is one of the most favorite places of Khachmaz residents and visitors to the city, was established in 2006. In 2013, after the major construction works carried out in the Museum of personalities, its area was increased to two hectares. 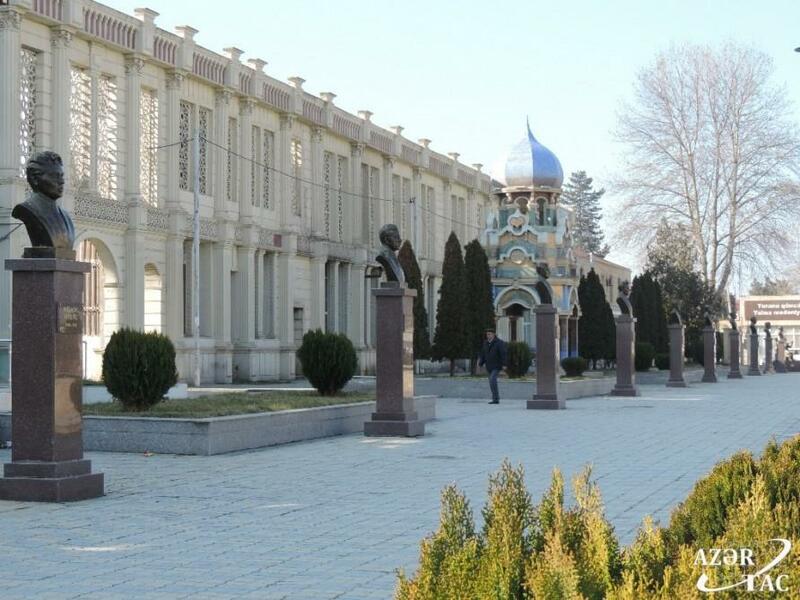 On the facade of the Local History Museum located in this area, monuments have been erected to famous genius personalities of Azerbaijan - Nizami Ganjavi, Imadedin Nasimi, Mohammed Fizuli, Nasreddin Tusi, Khurshidbanu Natavan, Mehseti Ganjavi and Huseyn Javid.